The tall stone walls and high cupola of the sixteenth century church of Saint Francis of Assisi in Old Havana echoed the cheer of Christmas carols, the sweetness of smooth jazz and the swing of traditional son during the Christmas concert by Camerata Romeu and guests. The modern and exclusive club Bar Sarao in Vedado was alive with the thirteen piece salsa and timba band of Alain Pérez; guests from Cuba and abroad dancing to the rhythms of salsa, rumba, jazz and flamenco fusions. The work of independent trombone player Eduardo Sandoval is a journey across different epochs; places – colonial and traditional, contemporary and fashionable, touristic and local; social strata – international embassy guests, the nouveau rich of Havana, fashion designers, and Buena Vista housewives; and musical genres – classical music, jazz, salsa, rumba, reggaetón and various fusions. The physical, historical, social and musical trajectory of the professional world of Sandoval tracks across Cuba’s capital, continuously navigating multiple musical and social identities. The versatile sound of his trombone maps a unique image of Havana, one of challenges, hopes, creativity, survival, exclusivity, tradition, fashion, novelty, entertainment, nationalism, cosmopolitanism and tourism. Camerata Romeu held a second Christmas concert at Fábrica de Arte Cubano (FAC), Havana’s leading art venue based in an old factory in Vedado. 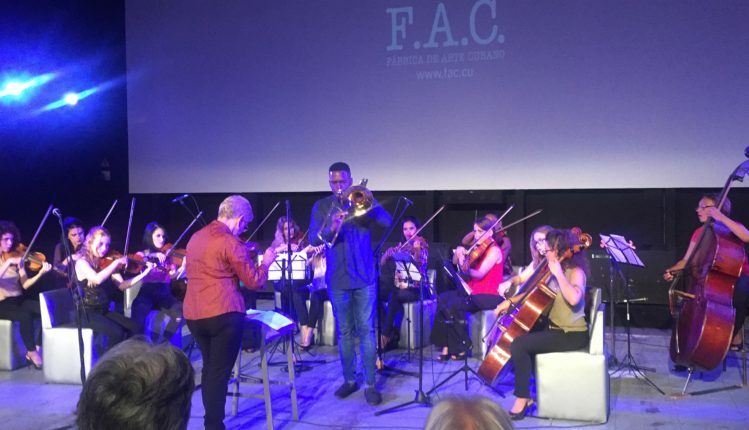 Both venue ambiance and audiences differed significantly from their first event at the San Fransisco Church in the ancient Basilica Menor, where spectators included primarily family and friends of the performers, local Cuban families, some embassy guests and a group of American tourists. Unlike the ancient convent building in Old Havana, a relic of Cuba’s colonial past, FAC is a fashionable arts club with strict entry policies, and often considered representative of Havana’s future as a modern cosmopolitan city. The concert was held at the cinema gallery with audiences from all ages, social and ethnic backgrounds and a large number of tourists. The repertoire journeyed across epochs and political systems, changing from the classical music and religious songs of the European colonial past to emancipatory jazz from the US, Cuba’s friend and foe, to the traditional Cuban rhythms of son and danzón. Sandoval’s sound meandered from the smooth play of US jazz trumpeter Chris Botti’s Cinema Paradiso to the explosive trombone of Alain Pérez’s salsa, further sounding in small recording studios in Old Havana, private parties in Varadero, military events, the recording of the new All Stars project (US production) and a new hit by collective Mas con Menos. Dancing, laughing and clapping to the clave, Mas con Menos transformed Abdala studio in Playa into a party zone, fusing reggaetón with danzón and Afro-Cuban rhythms in their new hit Mantecado. Sandoval’s jazz trombone further filled Bar Tatagua on Paseo de Prado (where premier fashion label Chanel held its first catwalk in Cuba in 2016) during a private arts and fashion event with red wine and canapés. The venue derives its name from a legend from the region of Cienfuegos about the mystic Cuban witch butterfly. Sandoval’s intense salsa and fusion sound, as part of the band of recent Latin Grammy nominee Alain Pérez, played in the popular government owned salsa and timba venue Casa de la Música in Miramar and the modern private Bar Sarao in Vedado. The publicly run music house has steeply priced matinee entry of $15 for tourists and $3 for locals. Besides high prices, the venue is characterised by basic side-road-cafe like furniture and audiences comprise Cubans and foreigners. The Cubans are often dance teachers with their foreign salsa students, Cubans living abroad, musicians, or locals earning high income. The atmosphere of the venue transforms with the live music and audiences dancing regardless of their age, social or ethnic background, locals or foreigners. By contrast, Sarao’s entry is $5 for locals and foreigners alike. It has upmarket white leather furniture and tables are reserved on the basis of set minimum consumption or for select celebrities. The stage is less than a fifth of the size of that of Casa de la Música, yet it accommodated the same size band, creating a vibrant party atmosphere. Havana is indeed a city of contrasts, controversies and contradictions, existing simultaneously in the past, present and future, and its music scene reflects the nature of Cuba’s capital, its versatile history and aspirations for what lies ahead. A mix of first world, third world and other world, the capital’s social and music life swings like a pendulum between extremes. The sound of Sandoval’s trombone traveled from the wealthy and stylish to the underprivileged, from international to national, from public to private, from traditional to cutting edge and innovative, from Christmas carols to reggaetón beats. Sandoval’s background and career further reflect these contrasting aspects of Havana. An independent Afro-Cuban musician who has performed across Cuba, Europe, South America and the US, Sandoval is trained in classical music; he is a follower of Cuba’s Santeria religious practices reflected in his compositions such as Afro en Casa from his first album Caminos Abiertos, and an innovative jazz composer and player fusing jazz with traditional Cuban beats, digital fusion and samba rhythms. Next Post Deathless: "They Tried to Bury Us but They Didn't Know We Were Seeds"